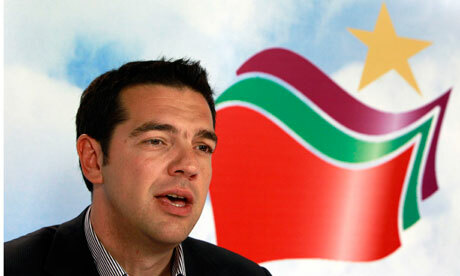 Will Tsipras Blow Up Europe? The world’s eyes are on the Greek election, and whether or not Greeks will elect New Democracy’s Samaras (widely-assumed to be pro-bailout, pro-status quo), or SYRIZA’s Tsipras (widely-assumed to be anti-bailout, anti-status quo). It is extremely important for Greeks to elect lawmakers who would respect the terms of the bailout. In recent days, opinion has swung back toward the status quo, with Intrade rating New Democracy’s chances of winning the largest number of seats at 65%, and SYRIZA at just 33%. While I cannot rule out New Democracy winning, I think that I’d flip those odds. Greece widely reviles German-imposed austerity, but fears the consequences of leaving the Euro — 85% of Greeks want to stay in. A vote for New Democracy would reflect fear of Drachmatization. Meanwhile, a vote for SYRIZA would seem to reflect the idea that through brinkmanship and the threat of Euro collapse, Greece can negotiate their way to a much more favourable bailout position. So why do I think SYRIZA are the likelier winner? The election is on a knife-edge, so I think the difference might be football. Greece — against all odds — managed to bumble through the Euro 2012 group stage, beating Russia 1-0 and likely setting up a poetic quarter final against Germany. I think that that victory against Russia will fire enough Greeks to try their luck and assert themselves against austerity. For Greece, this is an important election. Inside the euro, their heavily state-dependent economy will continue to suffer scathing austerity. Outside the euro, they can freely debase, and — as Nigel Farage has noted — enjoy the benefits of a cheaper currency like renewed tourism and more competitive industry. If Greeks want growth sooner rather than much later, they should choose life outside the euro (and by voting for Tsipras and trying tough negotiating tactics, they will be asking to be thrown out). But for the rest of the world, and the rest of Europe, this is all meaningless. As Ron Paul has noted, when the banking institutions need the money, central banks — whether it’s the ECB, or the Fed, or the BoE, or a new global central superbank — will print and print and print. Whether Greece is in or out, when the time comes to save the financial system the central bankers will print. That is the nature of fiat money, as much as the chickenhawks at the ECB might pretend to have hard-money credentials. Tsipras, though — as a young hard-leftist — would be a good scapegoat for throwing Greece out of the Eurozone (something that — in truth — the core seems to want). The real consequence throughout Europe as austerity continues to bite into state-dependent, high-unemployment economies will be more political fragmentation and support for political extremes, as the increasingly outlandish and unpopular political and financial solutions pushed by Eurocrats — specifically more and deeper integration, and banker bailouts — continue to help special interests and ignore the wider populations. This entry was posted in Current Affairs, Federal Reserve, International Relations, War and tagged 2012, 2013, draghi, euro, eurobong, eurozone, greece, italy, merkel, new democracy, papademos, papandreou, pasok, spain, syriza, tsipras. Bookmark the permalink. Hoppe talks about “time-preference” , the length of time for which a person or group tries to order a plan amongst natures spontaneity. I wonder which group, if the world is crudely and probably without authentic sophistication divided up into Savers & Debtors, tends to plan more for the medium-long term? And is planning for the medium-long term always preferable to planning for the short-term? Doubtful, considering only the rarest of things seem to exist in an absolute state. Is refusing to allow the failure of inept French bankers, for example, good medium-long term planning? More & more mass psychology weighted down with love and curiosity is pushing events into a surreal like enlightenment as intelligence becomes increasingly required and also easy to spot, thanks to information circulating like never before…. Aziz, why do list all of the above, “guest posts,” as comments? Fear is the most effective method of “modifying” human behavior, and it looks as if they are pulling out all the stops to insure that debt-serfdom wins the day in Greece. This is a great failure of the democratic ideal, that is, that majority will [can] actually access the proper information in order to make an informed decision. History seems to suggest that although representative forms of government distribute resources a bit more evenly, they can never get to the heart of the matter, that is, bring property issues, money-creation, etc., into the discussion so as to allow transparency to the most important issue, the mystification of labor-value produced/labor-value banked. Oh well, as Dostoyevsky said, psychology is like a baseball bat with two heads (something like that, approximate translation). I could spin this in 10 different ways explaining how the football victory makes them less likely two vote for Syriza. Yeah, it was just something wacky I was throwing out there. Of course, I hedged my words carefully in case this happened. If Albania is right next to Greece, why should Greece remain in the Euro, and not Albania? I think Lagarde is right. There are many other nations facing crushing poverty. If the Greeks can’t pay their debts they need to know why, then take appropriate action. If they don’t repay their debts, they need to accept the higher interest rate lenders demand for parting with their cash. Otherwise, the Bond Market can always lend to the Albanians, and invite them to the EU family. I must say that the discourse and content at your site is exemplary. My recent post, “Greek Elections and the Quandary of Finite Resources” sought to open dialog surrounding Peak Oil with a general reference correlation to the Greek elections. Your previous post, “What Peak Oil?” was a brilliant and perfect piece to bring into the fray, and your current post on the Greek election puts the icing on the cake. Glad I stumbled upon your site. I shall return to it regularly, and recommend it to my readers. So the Greeks chose the pro bailout “New Democracy”. It is funny how self interest shows itself at the ballot box. The Greeks gave themselves breathing space. Nothing more. I bet many will now take whatever Euro’s they have and migrate elsewhere in the EU, or abroad. Isn’t that what EU membership provides? Free movement of trade and labour? BTW if you are a rich Greek (Or any other nationality) and have $1,000,000 to invest you can buy residency in Australia or the USA (I guess it applies in other first world countries) Ahh being rich = freedom! And Australian Politicians demonise refugees fleeing from war torn countries we and the USA meddled in. Ah the hypocracy! I don’t believe the “Bailouts” will be repaid, and we’ll revisit this soap opera in a few months. Lets face it. The over consumption through cheap credit will never be repaid. Some tangible assets remain, namely Spanish or Greek housing along the coast. However, most of the debt binge has been spent, or shipped abroad to be defaulted on. It is a solvency issue. Not a liquidity issue. Something I intended to write in the article… If Greeks don’t go for the radicals this time (I’m still surprised they didn’t, although I fully understand why) they will next time. The bizarre thing here is Pasok are now refusing to go along with ND. So we’re looking at a third election unless this can be worked out. I worked for a Cypriot Bank. This is typical Greek bargaining. I bet Germany blinks. Germany has nothing to blink at. Worst comes to worst they will kick Greece out and bail out their own financial system with exposure to falling masonry directly.